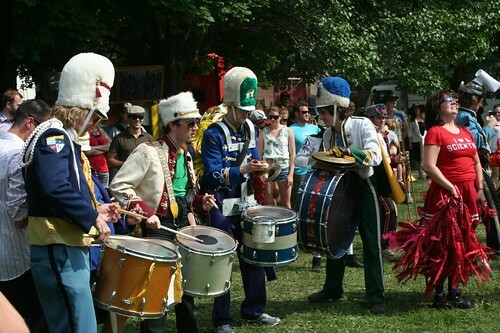 One of Chicago’s great cultural treasures, in my irreverent opinion at least, is the band Mucca Pazza. 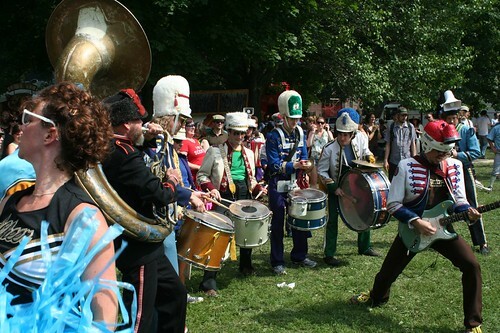 Billing themselves as a “circus-punk marching band”, this group of 30 musicians and performers employs all the trappings of a high school marching band, including their own mini-squad of cheerleaders, but with a wild abandon that represents what high school band might have looked like if the teacher had left and never come back, and the most energetic students took over running the show. 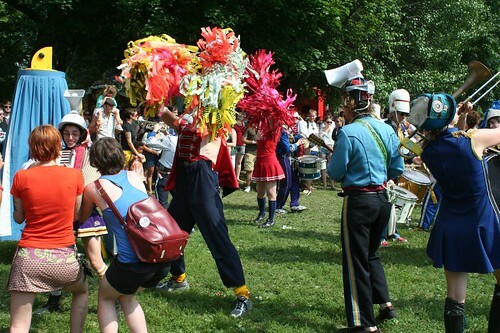 Mucca Pazza does indeed march during their shows, and dance, and spin, and run about through the crowd in every direction. At any moment you might get a cheerleader waving pom-pons in your face or a 5-second guitar solo played almost for your exclusive benefit. 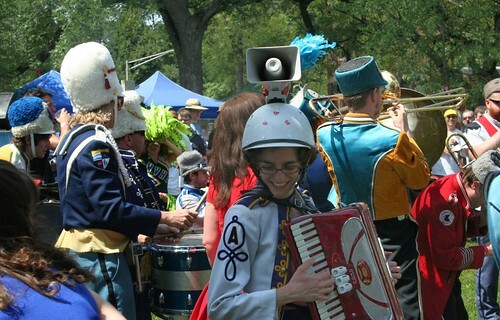 Some of the musicians wear amplifiers, with helmet-mounted megaphones on their heads, broadcasting their sound in one particular direction, and perhaps sending it to different areas of the crowd like a rotating tornado siren as they turn about. 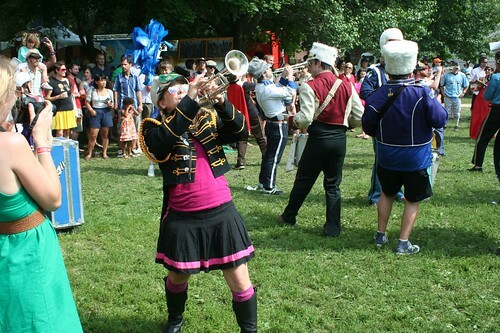 Groups of horn players might position themselves in different areas and play back and forth across the crowd. A trombone player might need the space between you and your neighbor for his instrument’s slide. The show you get depends on where you are, and will be different for every member of the audience. 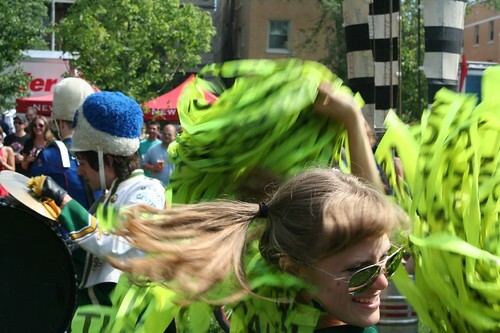 The band’s energy is frenetic, and improvisation is everywhere. It’s enough to make any standard rock band look dusty and tired. I happily bought their album, but listening to a recording on speakers cannot remotely compare to the experience of being surrounded by musicians playing their hearts out and having a blast doing it. And there’s no cheerleaders, either.